At the age of 44, Swedish tenor Jussi Björling was at the peak of his powers when he gave this recital in Carnegie Hall on September 24, 1955. RCA Red Seal recorded it, and released most (but not all) of the selections on LP. Later, a portion of that LP was reissued on CD. This "rediscovery" is important not just because it restores the contents of the original LP, but also because it adds nine songs or arias that weren't even released on the LP, presumably because of timing issues. In fact, these selections are receiving their first release here. The result is a very well filled CD. The reissue staff, faced with the choice of needing a second CD or trimming the applause of Björling's noisily appreciative audience, wisely chose the latter. For the record, the newly released selections are "Come un bel dì di Maggio" from Giordano's Andrea Chénier, "En Svane" and "En Drøm" by Grieg, Sibelius's "Demanten på marssnön," "Säv, säv susa," and "Svarta rosor," Sjöberg's "Tonerna," Turiddu's farewell from Mascagni's Cavalleria rusticana, and "Che gelida manina" from Puccini's La Bohème. At this point in his career, Björling was showing greater comfort with "heroic" tenor roles such as Manrico and Otello, and yet his voice retained the warmth, the golden glow, and the sweetness one hears in recordings he made in the 1930s. In this concert, he still is at his best in the more lyrical selections (a set of Schubert Lieder, the "Flower Song" from Carmen, Des Grieux's "Dream" from Manon, two songs by Tosti, and so on). Nevertheless, he still can tear passion to tatters in the verismo arias. It is unfortunate that no Verdi was programmed, as Björling was excellent not just as in the roles mentioned above, but also as the Duke in Rigoletto and Radamès in Aïda. Björling was among the previous century's great tenors, and the Carnegie Hall audience doesn't let us forget it for even a second. This is a world that is divided into those who love opera and those who love opera singers. I much prefer the company of the former. Frankly, I would have been happy with a little less vocal idolatry from Björling's audience, and I am pleased that some of the clapping, stomping, and yelling ("Hey Myrtle, we're going to be on a record!") has been edited out. Nearly a half-century after the fact, surely we're able to decide for ourselves whether or not this was a great occasion. Kudos must be given to Björling's unsung accompanist, particularly in the piano reductions of the arias. In practice, these seldom sound quite right, but Schauwecker copes valiantly with his thankless task. The Digipak presentation is lavish, as befits the material. The booklet contains not just texts and translations (an unexpected bonus), but also essays, and remembrances from two individuals who were lucky enough to attend this recital. 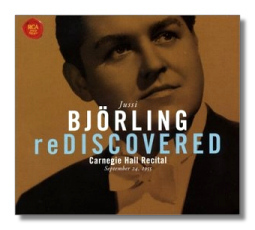 For Björling fans both new and old, this disc fills a gap, and then some.